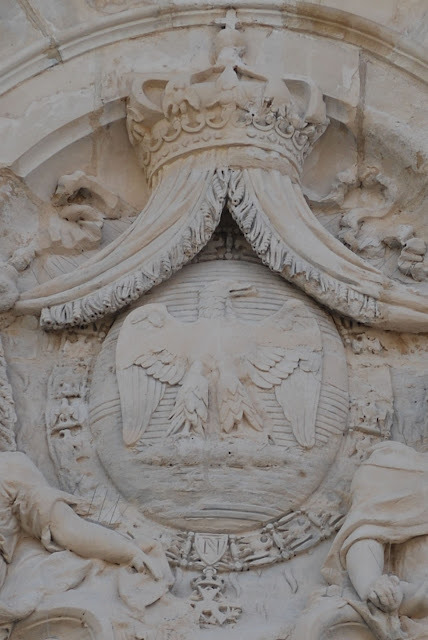 At the top of the facade of the building which displayed the arms of the City of Arras which I wrote about last time, was another different, and in this case, entirely unanticipated, coat of arms. I had noted in an earlier post about how Arras had been about 80% destroyed during World War I. Following the war, the city was rebuilt, and many of the buildings restored to what they looked like before that War. That restoration even included, in this instance, an historical coat of arms which had been superceded at good 100 years earlier. I had no idea that when they were restoring Arras to its pre-WWI state, they would also be restoring on a public building a coat of arms no longer in use, one which had been superseded twice, once following the defeat and exile of Napoleon I in 1815, and again following the defeat of Napoleon III at the Battle of Sedan in 1870.